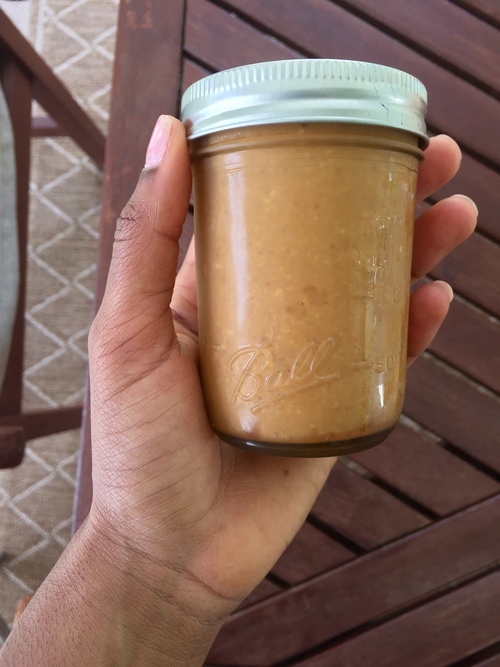 This recipe has probably made my love for peanut butter all the more ridiculous! Spread peanuts evenly on a large cookie sheet. Roast at 350 degrees for about 10 minutes (no oil yet, the natural oils from the peanuts are enough for now). Allow peanuts to cool completely. Transfer roasted peanuts to a food processor. Blend in a food processor with half a teaspoon of coconut oil and a touch of salt (if desired) until the peanuts are blended and creamy. Depending on how large your food processor it, you might have to separate the batch of roasted peanuts. The peanut butter will stay fresh un-refridgerated, but I recommend refrigeration to avoid oil separation (which is totally natural). Avoiding separation, however, makes it so much easier to grab a scoop and go! Try this recipe and spread on sliced apples, celery, toast, or even ice cream for a delicious, protein-packed snack!